Chris Maddalone and Seth Meltzer of Maddalone & Associates are prepared to renovate 99 Pine Street’s upper floors, bringing approximately 35 new market-rate residential units to the heart of downtown Albany. The renovation and partial conversion will take place on the property’s third, fourth and fifth floors transforming old office space into residential units totaling 34,000 square feet. All existing tenants are expected to remain at the location. In total the 5-story property on the corner of streets North Pearl and Pine consists of three buildings which have been combined internally over the years, totaling approximately 101,700 square feet composed of retail and office space. On June 16 the City of Albany Industrial Development Agency Board approved an application to provide New York State sales and mortgage recording tax exemptions to assist with the $6.7 million renovation and partial conversion of the property. The project team is not seeking a PILOT agreement through the City of Albany IDA. At its May board meeting, the Capitalize Albany Corporation Board approved a $400,000 loan administered through the Corporation’s Real Estate Loan Program to assist the project. 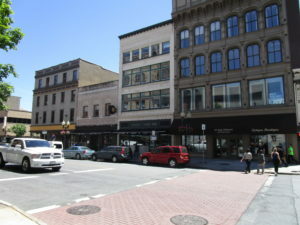 The Capitalize Albany Real Estate Loan Program was established in June 2010 to provide gap financing to qualifying real estate development projects to support revitalization. This is the third downtown Albany residential conversion project Maddalone & Associates has taken on in recent years. Last year the development team began its project at 40-48 South Pearl Street across from the Times Union Center, currently under construction, the team is transforming the 24,000 square foot property, mostly vacant since 2011, into 16 luxury market-rate apartments combined with street level retail and commercial space. In 2013 Maddalone & Associates was also involved with the conversion of two historic, five-story buildings at 522-524 Broadway. The buildings were converted into 14 one- and two-bedroom apartments and 2,800 square feet of commercial space. Maddalone & Associates is one of more than a dozen developers working on projects in downtown. Over the past three years, the Capitalize Albany Corporation Real Estate Loan Program has facilitated seven projects resulting in 140 new market rate units. In total these projects represent more than $26.8 million of investment. In recent years Capitalize Albany’s Impact Downtown Albany strategic plan and other initiatives have supported development of approximately 300 market-rate units in downtown holding strongly an occupancy rate of 97%. Currently there are more than 400 downtown apartment units either under construction or in the pipeline.